FORT LAUDERDALE, BROWARD COUNTY, FL –Internationally renowned 3-D Pop Artist Charles Fazzino has been selected as Official Artist of the 39th Anniversary of Winterfest. As Official Artist for this year’s themed event, “Dancing thru the Decades,” Charles Fazzino is also one of the judges for the parade. Charles Fazzino will be one of five judges celebrating this historic parade watched by an estimated 1,000,000 spectators along the 12-mile parade route. Winterfest is scheduled for Saturday, December 11, 2010 starting at 6:30 in the evening. 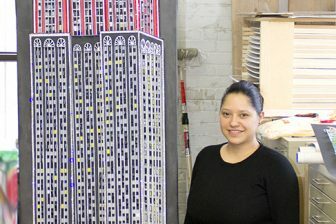 Charles Fazzino is well known for his extravagant and vivid 3-D New York City scenes. 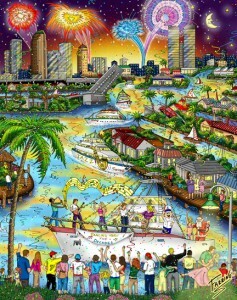 Some of his most recent commissioned official artwork includes the City of Fort Lauderdale Centennial Poster. Fazzino will also have a show at the Museum of Art Fort Lauderdale. 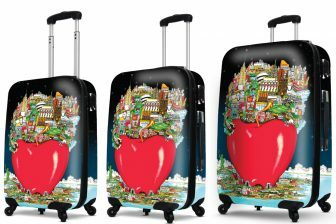 He is also known as the poster artist for the Olympics, NFL Super Bowl and NASCAR Nextel Cup Series. the annual kickoff to the Winterfest season. 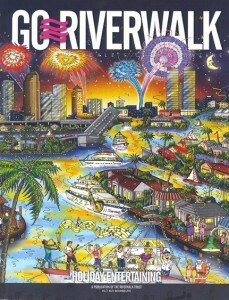 November, 2010 issue of “Go Riverwalk” magazine.